A bedroom should be a relaxing place where you can retire to at the end of a long day and the decor should reflect that. It’s hard to relax if your bedroom is cluttered and bursting with storage furniture. 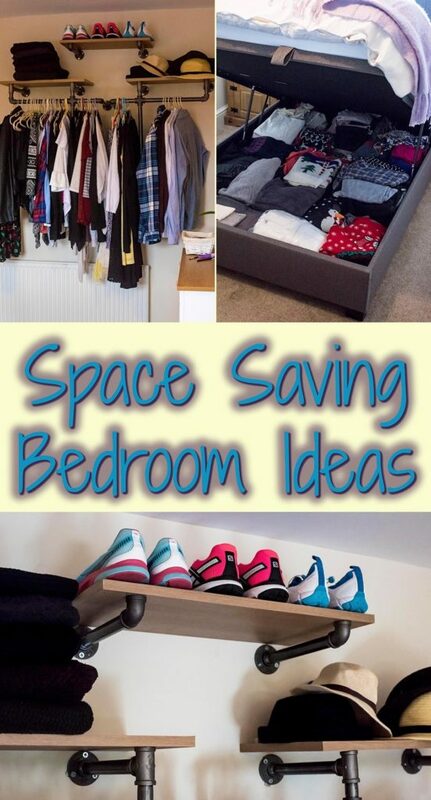 Here we share a couple of our space saving bedroom ideas. When we moved house, we knew that we technically had more space, in terms of square footage, but we knew we had less storage space. Less built-in cupboards to hide stuff away in never to be looked at again. We didn’t want to buy loads of cupboards to store our stuff, as they just fill up the rooms. So, we thought of ways we could save space. 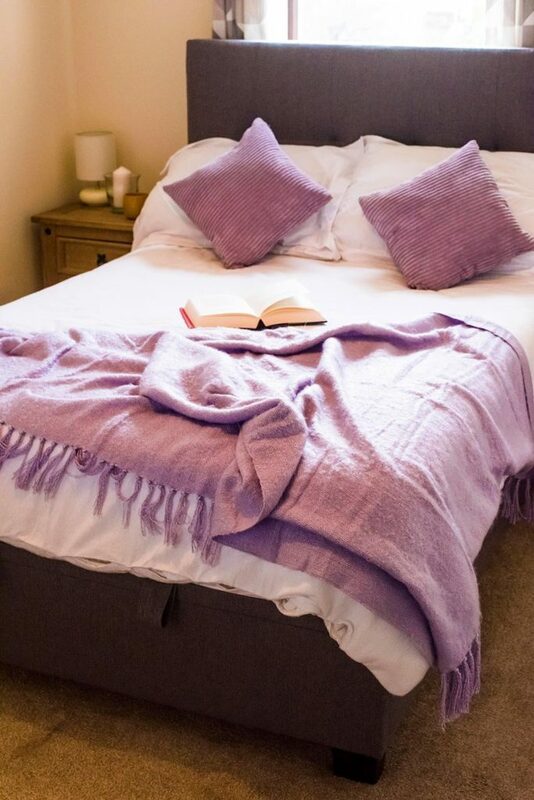 Do you want to be kept up to date on more posts like this Space Saving Bedroom Ideas? Please subscribe to the blog mailing list (it takes 30 seconds). You will get sent the new recipes straight to your inbox. Your email address won’t be passed on to anyone and you will never be spammed. We are not big on too many bright and bold colours, so we kept the bedroom clean looking with magnolia walls and white bedding. 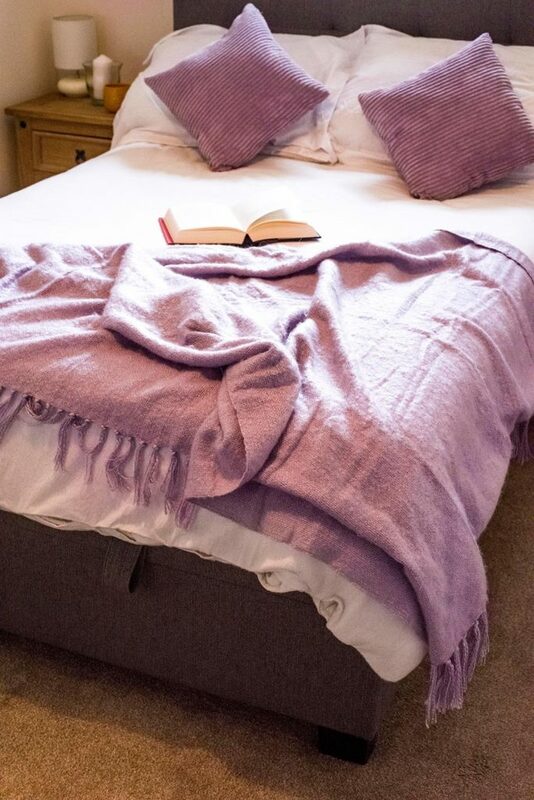 We didn’t want it to look clinical, so we added a pop of colour with purple cushions and a throw. It can be tempting to make your bedroom look really cosy with warm dark colours, but they absorb light making the room look smaller. Mirrors are another fantastic way to make a room look bigger, as if you angle them right then they give the illusion of depth. They also reflect natural and artificial light, making the room look bigger no matter what time of day. We had always planned to buy a big mirror when we bought this house, but can you believe that the previous owners left this mirror here?! It makes our room look so much bigger, not to mention having a giant mirror is great for getting ready. Avery also loves playing peek-a-boo in it. The bed is what everything else in the bedroom is centred around and it takes up the majority of space. So, it makes sense to use it as a space saving tool and make sure it has some storage underneath. 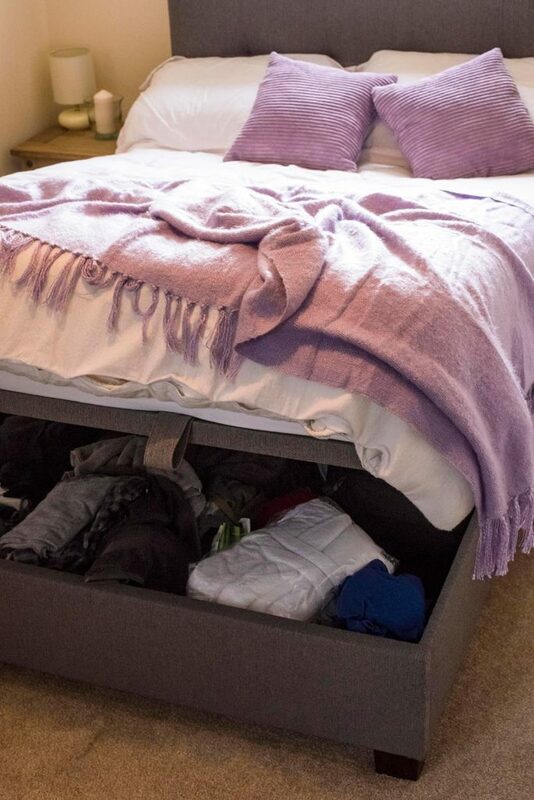 We have always had some kind of storage under our bed, but it has always involved holding the mattress up at an awkward angle whilst you lift the slats up, stop a cat jumping under it all and grab what you need. Well, no more, because we got this Ottoman Bed from Happy Beds. 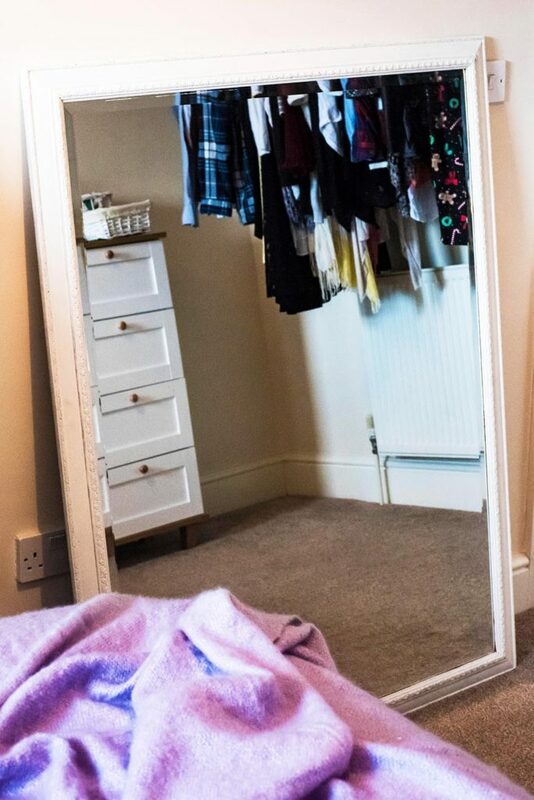 Because we don’t have a lot of space to store our clothes, we keep out what we need on a day-to-day basis, and everything else goes under the bed. This means we can easily store out of season clothes, like Christmas Jumpers and beach clothes, under the bed until we need them. We do keep some daily items under there too, like bath towels. It’s so easy to use the tabs to pull it up, that it doesn’t matter if you need to get something out every day. Happy Beds have a fantastic selection of mattresses too and ours is like sleeping on a cloud. A mattress is worth spending a bit of money on, but luckily there is a lot of value for money when it comes to Happy Beds Mattresses. If you don’t have much space in your bedroom, then an Ottoman bed is a must for extra storage. We wanted somewhere to store our clothes, but we didn’t want a wardrobe. In our previous house, we had built-in wardrobes, so they didn’t make the bedroom look so cluttered. We didn’t have them in the new house. Having a wardrobe would have taken up so much space in our already fairly small bedroom, so we went with an open and exposed wardrobe area that Dave built himself. As our house is over 120 years old, it was traditionally built with high ceilings. We wanted to make use of that height. I have always liked the look of having industrial looking rails to hang our clothes on and having everything open. Now, this isn’t something you are going to find in your local furniture shop! We bought it from an industrial pipe supplier – but I think the finished look is worth all the work put in to it. We used a product called Malleable Iron (sometimes known as Black Iron) pipe and fittings. It’s available in some plumbers merchants, but as it is quite an industrial product, it is easier to find online. The rails are simply different lengths of ¾ inch pipe joined together with various connecting tees, elbows and crosses. It is fixed to the wall with flanges and finished off with oak shelving. I am not really big in to make-up and jewellery, so having lots of space for that wasn’t needed. But, we made use of the space on top of our draws for a jewellery tree to keep everything organised. Some baskets to keep things in help keep things tidier. It can be easy to let a top of draws look cluttered and chaotic, but a couple of baskets (even if they are chaotic inside) can tidy things up in a flash. Pictures and a plant go a long way to making a bedroom feel more homely too. Our bedroom isn’t very wide, but we did just have room for these bedside tables. Not only are they great for being able to put candles on, to make the room look more cosy without having to use dark colours, but they also provide plenty of space for storage. We have a fairly small bathroom, so we store all the extra cosmetics we have in these as well as the overflow of first aid and medicine. There is also a stack of books in mine that I really need to read! Just because you don’t have a large bedroom doesn’t mean you can’t create a light, spacey area to relax in. 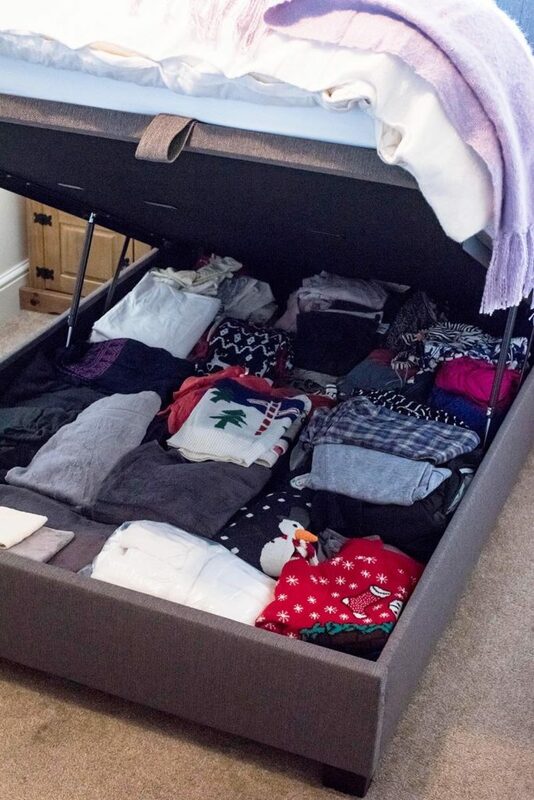 Get yourself an Ottoman bed to store all those extra clothes under. Use the ceiling space to put up rails to hang your clothes on, and keep everything nice and bright with a pop of colour. What are your space saving bedroom ideas? We without a DOUBT, need a new bed with the under carriage storage – what an amazing idea!